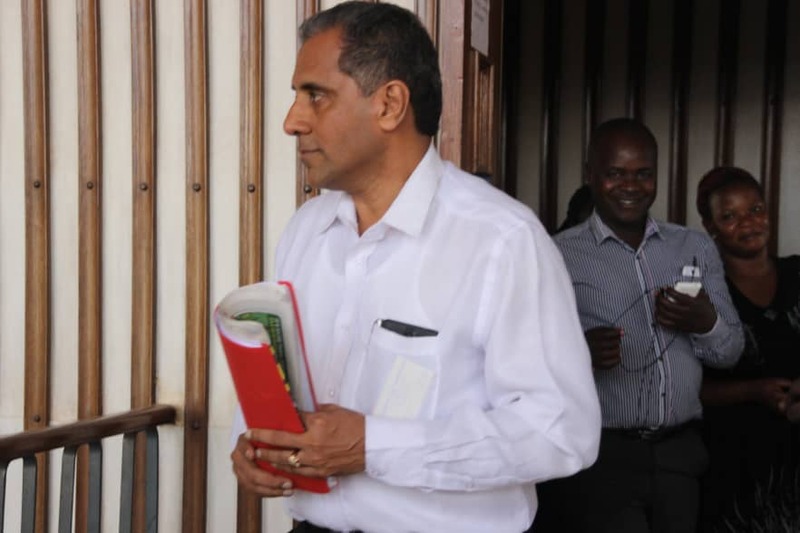 KAMPALA– City businessman Shumuk Shukla who was arrested on Monday afternoon on allegations of forging the signature of the Chief Justice has been granted police bond. The businessman was granted bond on Monday evening from Jinja Road Police station where he had been transferred from the Criminal Investigations Directorate in Kibuli, a Kampala suburb. His lawyer Badru Bwango said they have been given bond to return to Police on Tuesday at 8 am and they are expected at Buganda Road court at 9 am. Addressing journalists shortly after his release, the businessman said he was arrested on the orders of Angella Katatumba, the daughter of the late Boniface Katatumba with whom Shumuk had a long-standing court battle over property. “Yes I was arrested from CID headquarters this afternoon by Angella Katatumba…..that I forged the Chief Justice’s documents,” he said at Jinja Road Police station parking yard at 9:30 pm. In 2009, there was a court battle between Katatumba and Mukesh, the proprietor of Shumuk Springs Development, Springs International Hotel and Shumuk Financial Services, concerning several property titles. The case was one of breach of trust. Katatumba contended he sold his property, the Katatumba suite, now Shumuk house with its 92 condominium units at USD5m in order to pay off his creditors. However, Shumuk a ‘trusted friend’ accepted and later after paying USD1m, decided to move out of the deal and asked for a refund of the money. When Katatumba failed to pay the money, he moved in to take over his (Katatumba’s) property in Banda, an island in Ssese, Kalangala District, hotel diplomate, located in Kisugu, Muyenga and many others. In his ruling, Justice Henry Peter Adonyo of the Commercial Court ordered Mukesh to return all the property, titles and proceeds he received from tenants in the condominium units back to Katatumba. He awarded Katatumba sh300m and general damages at court rate of 6 percent per annum. Mukesh was also ordered to pay USD1.9m (around sh6.59b) to Katatumba at a commercial rate of 24 percent per annum. Road Court Chief Magistrate James Eremye in 2016 ordered one of three people accused of forging Chief Justice Bart Katureebe’s signature to pay a fine of Shs19 million shillings after pleading guilty to fraud. City businessman Saleh Luzinda pleaded guilty to having on April 16, 2015, obtained over Shs 437m from Mukesh Sukla, the Executive Director of Shumuk Group of Companies, falsely pretending to have been sent by the Chief Justice. He prayed to court to pardon him but Chief Magistrate Eremye instead slapped a Shs1 million fine on each one of his nine counts of obtaining money by false pretence, forgery and uttering false documents or an equivalent of three years’ imprisonment in Luzira.